This project was an exercise in creating work using unfamiliar information, and then swiftly moving on and using that new work as a base for the next phase, and then again. Each new phase necessitated learning from the past one but also letting it go and not trying to recreate the original piece every time. By my count, the final shadow piece is 8 degrees of separation away from the original object: object > touch > description > drawing > cardboard sculpture > sculpture > drawing > tracing and carving > light/shadow piece. To start off this work, working in pairs, we did drawings based on partial information. One of us wore a blindfold and described an object by touch to the other, who drew the object purely from the description. So the resulting drawing (already a translation from a 3D object to 2D drawing) not only was based on touch rather than the more familiar sight of an object, but also passed through the prism of being described out loud by the toucher and reimagined by the drawer. This made it difficult to come up with a full coherent drawing, perhaps because I was focused on being as accurate as possible rather than having a full picture. Others in the class used more imagination and produced a full drawing – though we had the same object, our drawings were very different. Based on the drawing we made of the object’s description, we moved on to creating cardboard sculptures, using only corrugated cardboard, paper, masking tape and gum tape. Because my drawing was kind of piecemeal, I focused on incorporating aspects of it into the sculpture: I planned to convey the textured surface of the sphere, the tubes going through it, and the strings/spikes with the curved structures on the end. I struggled with the gum tape not being strong enough to secure the tube ends I wanted to stick to the surface of my sphere of cardboard, and with the masking tape not being strong enough either. I decided to weave cardboard strips through a main piece of cardboard (using an adapted crochet-type technique from the orange Vin+Omi jacket), so as to be able to both keep the wrinkly cardboard texture for the surface and have something to attach the spines to. I also tried to attach the surface pieces of cardboard to the sphere using loops of masking tape, hoping to preserve the external texture and appearance, rather than sticking masking tape all over it. Unfortunately the masking tape loops were not strong enough, and even when I switched to using the tape normally it struggled to hold the surface pieces down. The sculpture ended up looking messy and unfinished, although I did manage to attach some spines all over – counting that as a victory! In a last nod to the drawing stimulus, I added loops of cardboard to the tops of some of the spines, to embody the cups at the tops of the spines/strings. The ultimate issue was that I tried to achieve both an interesting surface texture and spines fixed to the surface, and this was too much for the materials available. To fix that, I’d either need to aim for less (eg either an interesting surface or spines all over), or use different materials. The next phase was to translate the cardboard sculpture into a new sculpture, using whatever materials and methods we could get out hands on. I planned to pick out the three aspects of a textured sphere, a tube implied through the sphere, and spikes sticking out of the sphere. Using distressed denim for the sphere and wires for the spikes, I intended to sew a stuffed sphere of denim (with blanket stitched holes at opposing ends for the ‘tube’), but I immediately ran into a similar issue from before: how to adhere the spikes to the surface so that they would stick out straight but not mar the texture? To resolve this, I changed tack and built the structure initially out of the wire spikes instead, rather than starting with the sphere. The wire spikes were becoming unstable and bent when they had to support their own weight, so I got a coat hanger and added the element of it being a hanging sculpture. The size was now determined by the stand height. To build up the sphere at the centre of the spikes, I used strips of denim, distressing them with a craft knife, weaving them between the spikes, and securing with needle and thread. Looping the ends of the wire was an attractive translation of the cardboard loops on the previous sculpture, and when they didn’t stand out enough I daubed some with black nail polish for a colour and texture highlight. I abandoned the surface tube on this sculpture, but I sacrificed it to be satisfied in achieving both the spikes and the surface texture, which I considered the essence of the stimulus sculpture. This is my favourite phase of the project, because it was very fulfilling to be able to solve the problems with the initial sculpture by using new materials, and to produce something which effectively translated the essential parts of the source. 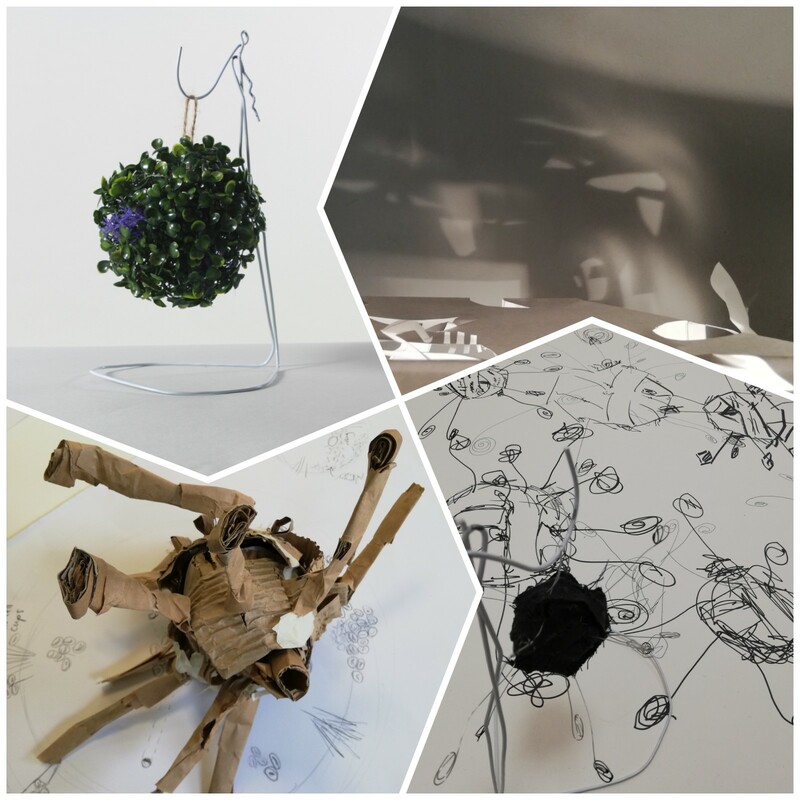 For this phase, we used the new sculptures as stimuli for abstract and overlaid drawings. To try to free the hand as much as possible, I did some left handed and some with both hands at once, as well as one drawing with only straight lines – to force myself to translate the shapes again. I also did some drawing with my eyes closed, playing around with both a free hand and the absence of visual input that we used in the first phase. Part 5: into the light! For the final phase, we used the abstract drawings as a base to choose and trace some lines on a new sheet of paper. We then cut the lines to create shapes that would fold out, folded the paper to make it stand, and put light through the whole thing to see what new shapes would be created. As the light moved the shadows it was kind of unnerving to find myself recognising shapes like birds and faces: to notice my imagination working to interpret and translate the images yet again. Another layer has been added to this project! As an examination of the translation, I’ve used photoshop to layer images of my original object, second model, and abstract drawings together. I find the most interesting resulting image to be the one where I included the 3 images twice each, because the multiple layers really emphasises the plurality of existences that this project has put the object through. I want to use this image layering technique to explore representing other pluralities of existences, such as plants at different times of year, and the self (particularly as a trans person). Also interesting is this series of images which uses varying opacity to cut through the degrees of translation and suggest the two objects morphing directly back and forth.